Deaconess Hospital, LLC was an acute care, community-based hospital located in the “Old Brooklyn” neighborhood on the near West Side of Cleveland, Ohio. Deaconess was a for-profit, independent hospital providing full medical services including inpatient and outpatient medical and surgical services. MelCap Partners acted as the investment banker and financial advisor as part of a plan of reorganization under §363 of the Chapter 11 Bankruptcy Code to Deaconess Hospital. 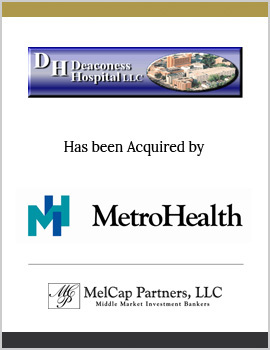 Deaconess and its affiliates, Pearlview Square, Inc. and Indoga, Inc., were sold to The MetroHealth System, a 728-bed public teaching hospital.